In our previous blog we discussed the differences between SAP EM and Document Flow. Now it’s time to start to dive in to the details of SAP Event Management and whereas could we start, other than to describe an event? Events that actually occur (actual events). These events are typically provided externally by the systems that interface with SAP EM. Information included on these events would be 1.) date of the event, 2.) time of the event, 3.) location of the event, and 4.) person or persons involved with the event, as well as any applicable measurements pertaining to the event. An example of the latter would the weight or temperature of the material at goods receipt. Events expected to occur (these events are called planned events, expected events or milestones). 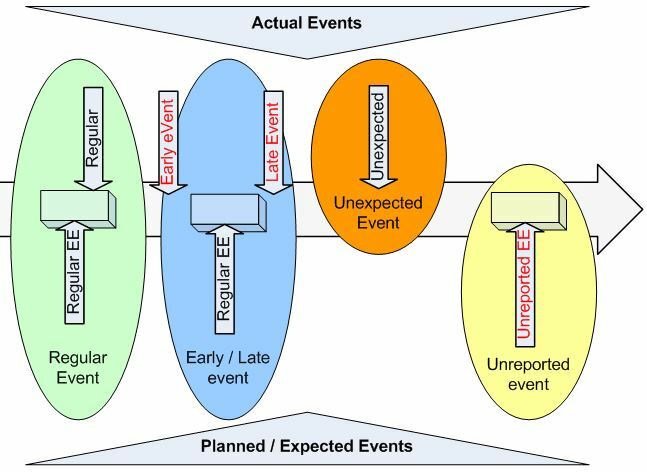 Expected Events are based on ‘The Plan’ of when each event in the process chain should occur. Location, partners and statistical measurements are also part of the data on the expected event. ‘The Plan’ is not just time based; it is also partner, location and measurement based. These two event types need to be compared against each other, that is, compare what actually happened against what was planned. In order to provide a more finite comparison, the types are split into four different categories. A regular event is an event that occurred within the planned expected time interval. The planned event has an early start date time entry and a late start date time entry. Any event received between these intervals is deemed a regular event and no exceptions are raised. An early event is an event that occurred before the start date time specified in ‘The Plan’ for that event. A goods receipt was planned to start at 3:00 PM and to finish at 4:00 PM but the goods receipt came in at 2:00 PM. The event is before the specified early start time, and is labeled an early event. In most cases if a task is performed early it is not seen as an exception, but it could be. Customers specify that they do not take deliveries before 3:00 PM, as this time is the beginning of their first shift. If the delivery occurs at 2:00 PM, then no one is there to receive and unload the shipment. This would indeed be treated as a situation to avoid in the future and is thus an exception. A late event is an event that occurs after the end date / time specified in ‘The Plan’. In the first example, if the goods receipt notification is received at 5:00 PM, it will be marked as a late event. Once again, the choice will be made as to whether this late event is treated as an exception or not. This option is a design choice allowing the flexibility to respond immediately to relevant exception cases. An unexpected event is an occurrence that was not planned for in the normal operation of this process. An example would be any event that causes a delay (such as roadside accident). Although not all processes experience this event there is still the need to cater for this event in the design and corresponding configuration. An unexpected event is an occurrence that may happen but is not part of the normally planned operation. For some processes (the tracking of returnable transport items), it is not typical to have a plan for the event and all events in the process are treated as unexpected events. An unreported event is an event that was expected to happen at a certain time but never did. These events are also typically treated as exceptions where subsequent processing is proposed and assigned for immediate attention, such as the Goods Issue is late in occurring according to ‘The Plan’. The responsible customer sales representative for the order is notified that there is a potential delay in the shipment to the customer allowing them to reset the customer expectation. In our next blog we will dive in to the details behind the event and the event message and describe where the early and late values play a role.